This is one of the finest locations on the El Valle resort. 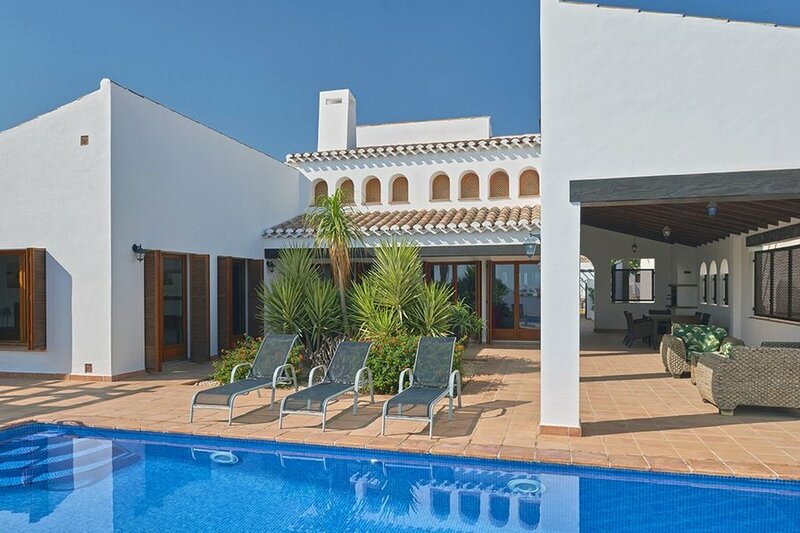 The way the villa is set provides a great deal of natural privacy, with little or no danger of stray golf balls while providing beautiful views across the golf course towards the Mar Menor. This style of villa has about double the ground space of the smaller, 'alcor' style villas and gives a sense of being able to breathe. Inside there are marble floors, a huge vaulted ceiling, and luxurious touches like a spa bath and a dressing room in the master ensuite. There is little passing traffic as the villa is a block away from the main road through the resort, and there is a children's play area in a square nearby. If you are coming out of peak season the pool heater might be attractive! As this isn't always required you can choose this as an optional extra, and we will turn it on for the length of your stay. El Valle is a quiet, high quality resort with a Jack Nicklaus designed golf course providing acres of green, open scenery. There are basic facilities such as a small supermarket and golf clubhouse onsite, and the sister resort of La Torre just down the road has more restaurants and bars. If you value quality, space and a little bit of luxury then this villa will provide all that you need. The terrace and pool are set above and overlooking a short hole on the El Valle golf course, with the Mar Menor in the distance. PLEASE NOTE that the pool is not enclosed so non-swimmers must be closely supervised at all times. The terrace gets sunshine all day, and there is a also covered terrace area for outdoor meals and for those who prefer to stay in the shade. Internet access is at no extra cost to guests. Additional equipment can be hired through our local property manager.